One of the greatest International event highlight this year - Chartres welcomes the individual time trial on the stage 19 of TDF. This is the last stage just before the grand final in Champs Elysées - Paris and considered as an important stage in the 99th edition of the Tour de France. Watching Tour de France in person? Share your story here! Chartres as a host for the second time! Chartres has already hosted a stage for the tour in 2004. 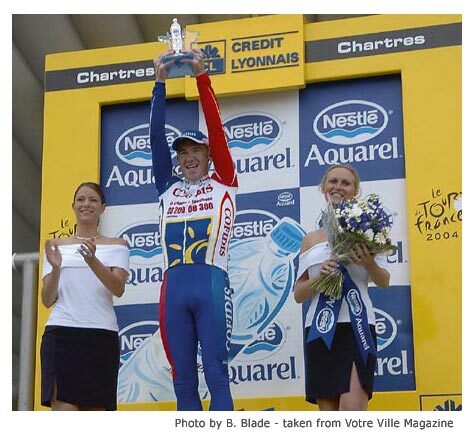 That time was in July 8, 2004, the fifth stage with 200,5 km distance race from Amiens to Chartres. The race winner was the Australian rider, Stuart O´Grady while a young french, Thomas Voeckler, lead the general classification and awarded the yellow jersey. Liege, Belgium has the honor to host the 99th edition tour start in June 30. 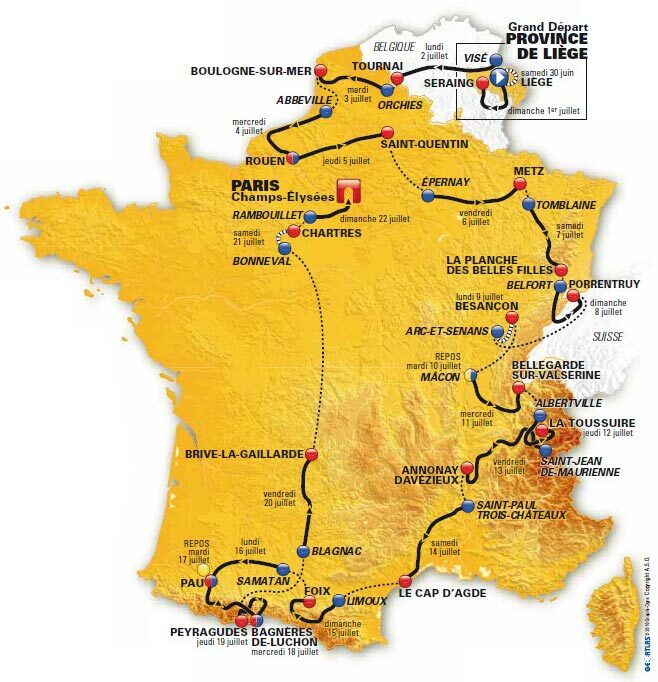 The tour itself will cover 3.479 km distance - one prologue and 20 stages (includes 2 individual time trial). Chartres host the stage 19 - an individual time trial, an important and precious stage of all the race also the last stage just before the grand final in Paris. The stage 19 distance is 53,5 km - departs from Bonneval to Chartres on July 21.
Who could be the winner this time? Will Thomas Voeckler win in Chartres for the second time? Unfortunately we would not meet the Spain rider, Alberto Contador as he was banned from the tour for the doping issue. This is the most fun part mostly for children - the publicity caravan parade! First created in 1930, vehicles with colorful decoration usually pass before the riders, has since then become a part of the tour. The map tour of Chartres Stage 19, which is an Individual Time Trial stage, is up. I created the map below accordance with the information on the local magazine (Votre Ville). The publicity caravans parade scheduled to depart from Bonneval 9.35am, following by the first racer at 10.20am. They are expected to arrive in Chartres within one hour. The finish line is in Rue Jean Mermoz, in front of Speedy Store. The tour camp, set up for all the teams and equipments, press people, Tour staffs, etc is at Jean Gallet Stadium and Hippodrome de Chartres. I could spend hours in front of television watching the race with passion, stage by stage. Honestly, my intention is not in the race itself, I am more interested to the stunning landscape views of the cities where all the racers passed by. However watching the tour in person is a new experience for me. Read my story of watching Tour de France in Chartres. How about you? Do you too have a fabulous experience in watching the tour in person? Do tell your story! Watching Tour de France in Person? 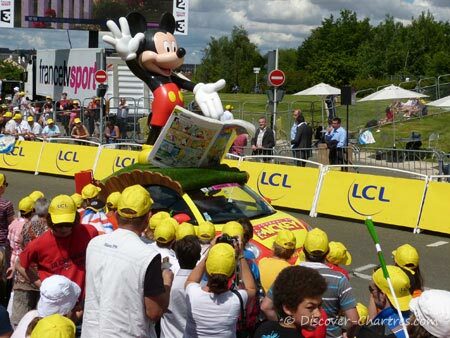 Share your story, pictures or great tips about watching Tour de France in person!